I did the manual fix on mine, as it only takes a few seconds to update each gallery. This entry was posted in Computers on April 30, 2009 by Sharpo. Needless to say I have some photos, some at Kidderminster as the train was leaving, others of it at Highley. Not waiting to see it depart from here as I’m hungry & want some lunch. 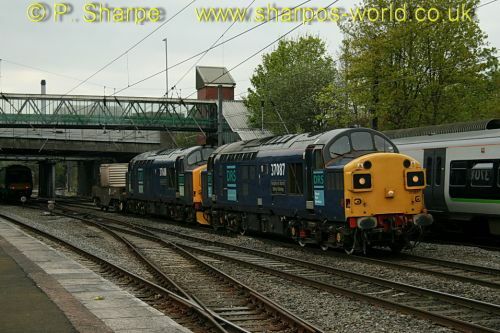 This entry was posted in Severn Valley Railway on April 28, 2009 by Sharpo. Only at Bromsgrove for about 20 minutes, during that time I photographed 170523, 170633, 43303, 43384 and finally 47818 with power car 43056, which was being moved from Brush at Loughborough to Landore..
A cloud passed over as the HST approached, I’m sure we’ve all had photos like that before, but at least the sun was shining for the Class 47 & power car. This entry was posted in Sharpo's World Photo Updates on April 27, 2009 by Sharpo. Down by the river to see 42968 on the Venturer, heading for Arley. Up at the station, 7802 was on the LMS set, passing 46443 on Footplate Experience. Next trains to Cross were 7812 on the GW diner & 4566 on blood & custards. Good to see plenty of people out & enjoying a train ride, plus the lovely weather. This entry was posted in Severn Valley Railway on April 26, 2009 by Sharpo. Heard this move was on today, so headed to Bromsgrove. Good job I was there early as the train passed about 25 minutes ahead of schedule. Took a few photos, will sort them later. This entry was posted in Main line on April 25, 2009 by Sharpo. With the rain falling quite heavily when I opened the curtains this morning, the walk to Arley looked like it was off. Fortunately it brightened up and we made it to the station. The 11.38 for Kidderminster was hauled by 42968 with the LMS set. Next trains were 4566 to Bridgnorth with blood & custards, crossing with 46443 on Footplate Experience. Finally, 7802 on the teaks with the 12.56 to Kidderminster. This entry was posted in Severn Valley Railway on April 25, 2009 by Sharpo. Good to see 6100 & 246, long time since I saw 1306 as well. 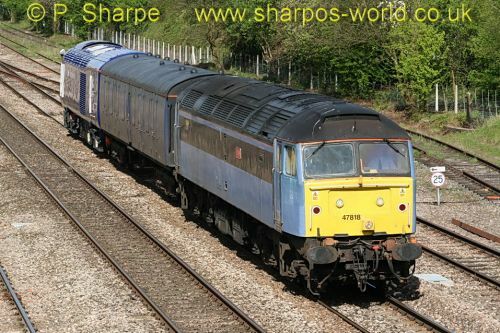 This entry was posted in Preserved Railways (not SVR) on April 24, 2009 by Sharpo. I had plans to see 3 trains today, would I succeed in seeing them all? Unfortunately it was not possible to go to just 1 location to see them, so had to move for the 3rd train. The day got off to a bad start, the first train I had to travel on at 09.35 was cancelled – so had to wait 30 minutes for the next one. Because of this, there was not time to change at Galton Bridge for the local electric and I had to go to Snow Hill & run to New Street to catch the DMU to Walsall. I arrived at Walsall about 3 minutes before 62005 appeared from the tunnel, running about 10 minutes early. So, only just managed to photograph the first of the 3 trains. 37670, hauling 66250 & 66124. A couple of minutes later, the train for New St. arrived, and we were on it. Then racing across to Moor St. for a train to Dorridge. Units seen between here & Dorridge were 168110, 168002, 168112 & 165034. Finally, the 3rd “target” for the day, the Colas train to Dollands Moor, with 47749 & 47739. Then off home. This entry was posted in Main line on April 23, 2009 by Sharpo. Seen at Dorridge, working the Colas train to Dollands Moor. Makes a change for me to be adding photos again. Haven’t really got back into a routine as yet, so will tie up loose ends later. As mentioned in the “Main Line” category, I saw 6M67 at Longbridge today – this is the Bridgwater to Crewe flask train. Unfortunately it doesn’t run round the Dark Side anymore, meaning if I want to see it then I have to travel. At least it passes this area in daylight now. 66177 worked the 6V06 Kingsbury to Cardiff scrap. Two northbound HSTs were also seen, 43301/03 & 43384/21. Plus a few DMUs of course. This entry was posted in Sharpo's World Photo Updates on April 22, 2009 by Sharpo.